Blogging has seriously become one of my favorite things to do over the past few years. I started this blog just as a creative outlet, having no idea the potential it had. 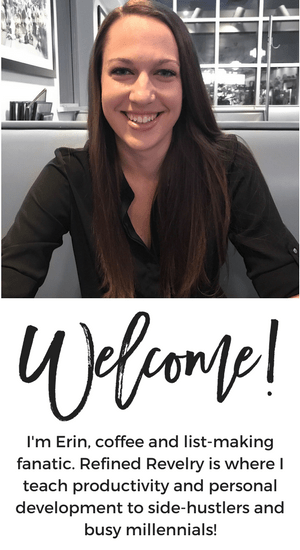 Since then, I have grown it into a small business where I have the opportunity to make a side income, engage with and get to know my readers, and connect with a community of other online small business owners. 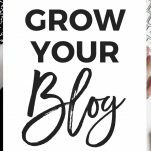 Starting a blog is one thing, but figuring out how to grow your blog is NO JOKE. I’m not going to sugar coat it, it’s not easy. And there’s a LOT to learn. I want to help take some of the guess-work out of it for you! I recently published a blog post with all the technical steps to start your own blog in 2019. 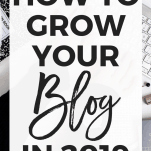 In this post, I’m taking that advice one step further and teaching you how to grow your blog in 2019. There are lots of great ways to get people to your blog. But when they land there, you need to have great content to share with them or they probably won’t come back. First of all, figure out what your readers want to read about. You can do this by looking at the questions you frequently get from readers via email, social media, or blog comments. Also, you can take a look at your Google Analytics data and see which of your posts have been most popular. You might see a trend and notice that your readers love a certain type of post. In additional to the topic you’re writing about, there are a few key pieces that every high-quality blog post should have. The first is a title that is going to draw people’s attention. 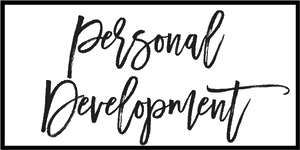 When someone is scrolling through social media, you want them to stop when they see your blog post title! You’ll also want to include high-quality images. This is what will allow you to draw traffic to your blog using Pinterest. Posts with high-quality images also drive more traffic on Facebook and Twitter. Finally, and most importantly, your post needs to provide some value to your reader. Ideally, your post will include a few highly actionable tasks your readers can accomplish if they want to reach a certain outcome. 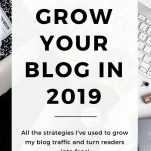 I basically ignored SEO for my first two years of blogging, which I immediately regretted when I figured out just how powerful search engines can be in driving traffic to your blog. Every month, search engines drive a higher and higher percentage of my blog traffic, all because of the SEO tactics I have implemented. SEO is basically about optimizing your blog posts to make sure they show up in search engines. You can most easily do this by using keywords to optimize your content, headlines, images, and meta information. If you’re on WordPress, I recommend using the Yoast SEO plugin to help you optimize your blog posts. It probably comes as no surprise to you that social media is a great way to grow and drive traffic to your blog! Social media drives the majority of my blog’s traffic each month, and because of that, I make sure to consistently promote my content on my social media pages. Not only should you share your new blog posts across your social pages, but you can continue to share your posts, especially the most popular ones, over and over again to continue driving traffic. And your social media pages aren’t just useful for sharing your own content. You can share other content your audience might find interesting and really start a conversation. Unfortunately, social media can take up a TON of your time. Because of this, I like to use tools to automate my social media marketing. You can see a list of those tools below! While social media can be a great way to grow your blog, it definitely has its downsides. First of all, just about every social media platform has an algorithm that determines who does and does not see your content. This means that when you share your latest blog post on social media, most of your followers probably aren’t seeing it. The second downside is that you have no ownership over that platform. If Facebook were to shut down your account tomorrow, it doesn’t matter how many followers you had, you can’t contact them again. That’s why starting an email list is the best way to get people coming back to your blog again and again! Once someone signs up for your email list, you have a direct way to contact them without relying on a social media algorithm to decide whether they should get your email. You also own your email list, meaning that should you decide tomorrow to switch email service providers, you get to take your entire list with you. Another benefit of email is that because people already get so many emails, they tend to be picky about what additional email lists they sign up for. Because of this, they’ll probably only sign up if they really love your blog, meaning they’ll be more likely to click through to every blog post. So how do you get people to sign up for your email list? First of all, continue to write the high-quality content we talked about above. Second, make sure there are multiple places around your blog where readers can sign up. 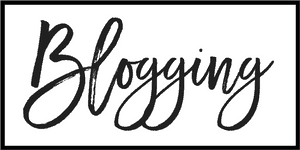 I have a sign-up form at the bottom of each blog post, as well as one on my blog’s homepage and scattered within some of my blog posts. Finally, offer something in return. You can give your reader something for free to entice them to sign up for your list. This might be additional content that goes with your blog post, a free printable, or something more substantial like a free ebook or email course. One of my favorite things about blogging is that it’s so affordable to start. 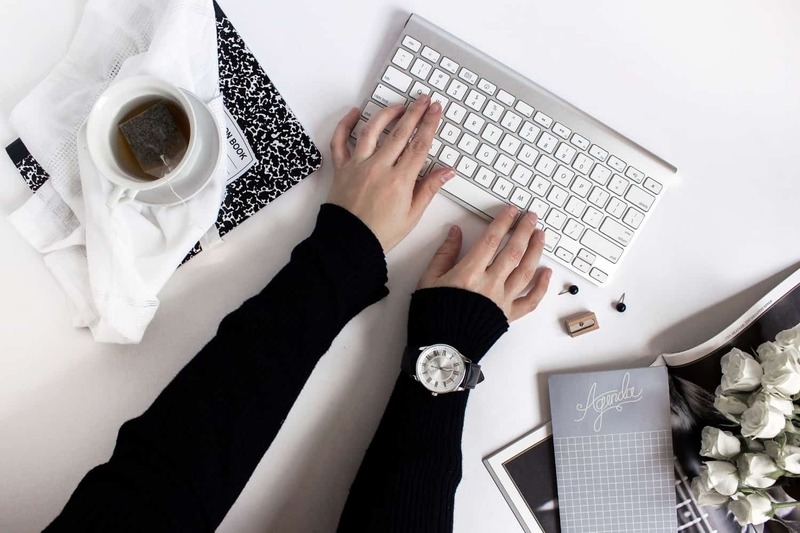 This means that whether you’re starting a blog just as a hobby or with the intention of turning it into a business, the cost of entry is quite low. Tailwind: If you’re only going to invest in one tool to promote your blog on social media, this is the one to go with. Tailwind is an incredibly powerful tool to schedule posts on Pinterest. Once you sign up, you’ll have the opportunity to schedule pins from your own blog, as well as schedule repins of other pins on Pinterest. Tailwind has a great feature called Tailwind Tribes, where you can share your posts with other Tailwind users to repin for their own followers, and then you can return the favor by sharing their content with your followers. Tailwind also has some awesome analytics tools, so you can see which of your content is performing best and which of your boards are most popular. More recently, Tailwind introduced their SmartLoop feature, which allows you to loop content. If you were a fan of BoardBooster, you will LOVE SmartLoop! SmarterQueue: If you find yourself spending WAY too much time scheduling social media posts, you’re going to love SmarterQueue. First of all, it is basically a WAY cheaper version of Meet Edgar, meaning you can loop evergreen content on Facebook and Twitter. You create your schedule and you can share your awesome content over and over again. SmarterQueue also makes it SUPER easy to find content from other sites to share and plug into your schedule. This is a newer tool for me but has quickly become a favorite. Planoly: Over the last several years, Instagram has become an increasingly important tool in blog promotion and at this point having a spot-on Instagram grid is almost essential. Planoly is an awesome tool that allows you to plan and schedule your Instagram posts ahead of time. They have a plan that is free if you’re posting fewer than 30 images per month, so you can try it out without committing to the cost. One of my favorite things about Planoly over some other Instagram schedulers is that you can type your captions out on the computer, rather than typing them on your phone. I just find that so much easier! Email Service Provider: As I mentioned above, email is an awesome tool to use to help you grow your blog. The first step to growing your email list will be signing up with an email service provider. I use ConvertKit for my email list, after having used a different provider for the first two years. ConvertKit is a really powerful tool with a lot of great features and is what I recommend to anyone looking to really segment their list or sell products from their blog. Traffic Transformation: This is hands-down the single most beneficial resource I have found targeted at increasing your blog traffic. 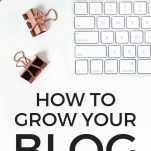 The author shares the 21 strategies she used to grow her blog from 17,000 to more than 400,000 page views per month. Strategies Worth Sharing: This eBook is specifically targeting at how to grow your Facebook page. Facebook can be a great tool to drive traffic to your blog, but most people are put off by the algorithm and frustrated with how few of their followers see their posts. This eBook helps you fix that! Pinning Perfect: This is my absolute favorite Pinterest course that I’ve seen (and also the one I’ve seen most recommended by Pinterest experts, FYI). Pinning Perfect goes into EVERYTHING from creating great images for Pinterest to the perfect Pinterest schedule. Okay, so I know that’s a lot to take in. 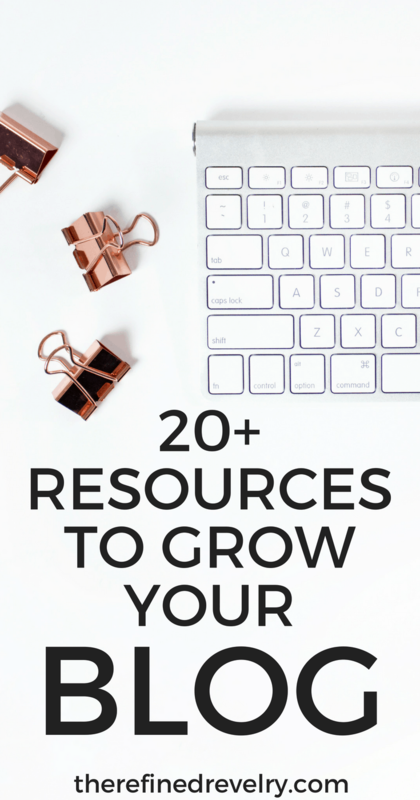 Learning how to successfully grow your blog is not easy, but it’s 100% possible, and using the tips I shared above will definitely get you on your way. 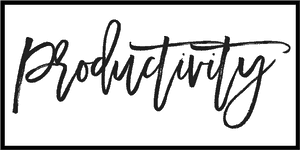 While you’re here, I would LOVE for you to leave me a comment and let me know what your favorite tools or tips are for growing your blog!